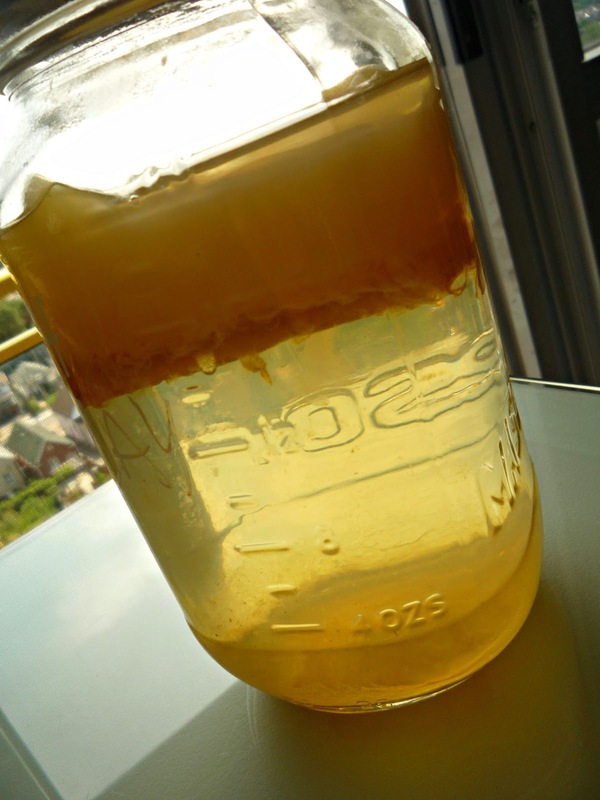 There are three ingredients necessary for kombucha brewing - sugar, caffeine, and a SCOBY. This is why when I read about Sandor Ellix Katz's friend making kombucha from Mountain Dew I had to try it! Beverages like Mountain Dew have the sugar and caffeine taken care of - so all I had to 'dew' was add a SCOBY. I started this fermentation back at the end of May. Other kombucha batches that I started the same day began to show signs of fermentation a lot quicker than this one did - so I gave it some more time. However a few out of town visits and vacations meant that this batch fermented way too long as it is now pure vinegar! I do not ususally drink pop - but I really want to try Kombucha Dew so I'm running out today to get another bottle! What is the weirdest thing you've ever done with a SCOBY? Toronto Indie Arts Market: Selling Kombucha Zine.